The TenniRobo supports all possible kinds of ball's spin: top spin, back spin, any side spin and no-spin. Even more - with our mobile app you can easily select angle of this spin. Actually you are able to combine, for example, top spin with side spin, or back spin with side spin. You can do it just in one click! This photo shows, how to select combined top spin with side spin. Green arrow shows resulting angle of spin, which the ball will have. head angle: you can change horizontal and vertical angles of head with very little step (more than 100 steps in each direction). At first - you can use any IR remote (from your TV, sound system, etc...). Just learn your TenniRobo with mibile app to understand this remote. IR remote very handy to use. You can easy start/stop the game, and you don't have to put your mobile phone on the table, so it's risk free for it. Yes! 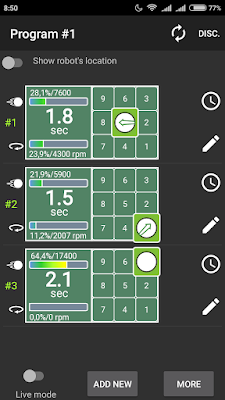 You can make your own sequences (they are called programs in the app) with different ball's behavior in each shot. For example, your program can begin with serve (back spin) to the center of table, second ball with mixed topspin/side spin to the left corner of the table and third ball without spin to the right corner of the table. The TenniRobo has container for 100 balls. This quantity is enough to play for about 4 minutes with usual game rate, after that you have to add other balls to tank, or collect ball. And this is good, because you have time for rest and analyze your game! Yes! You can use as old celluloid 40mm balls, as new plastic 40+ balls, and even more - you can mix them without any modification of TenniRobo. Just load them into the robot and enjoy your game! This is a great option, because (as you probably know) different balls have slightly different behavior, so you can have some randomization in your game (as human does). It is possible, because TenniRobo uses excellent foam-rubber wheels, which are not sensitive to the small deviation of ball's diameter. TenniRobo is mounted with standard tripod (usually used for photo or video cameras). And this is great! If you mount robot behind the table, you get much more freedom and "human-like" ball's behavior. With excellent digital spin control system of this robot, you can simulate any ball (or even series of different balls) that you want to play. TenniRobo can make very strong shots - distance can be longer than 6 meters (20 ft). So, you can mount your robot anywhere: near the table, far from table, in the corner, or even under the table. Have you ever dreamt of playing a game with your favorite table tennis star? Just do it! No, tripod isn't included at package, because many people already have own tripod and can use it with TenniRobo. Also, if tripod was shipped, it would significantly increase cost of shipping. It's easy to buy standard tripod in your country, if you don't have it. TenniRobo' wheels are very durable. For example, first prototype have worked about year in our table tennis club without wheels replacement. But it's very easy to adjust distance between wheels with standard screwdriver. You also can easily replace a wheel with another one by using a standard small wrench (10mm). Of course, replacement parts will be available. But let me to describe some parts of the TenniRobo. Main motors are VERY durable. Instead of other robots (which use brushed motors with short live term), TenniRobo uses brushless motors, that have only one part that could be broken - bearings, which have very-very long live term. I think this motor will be the last part that can be broken. Feeding system also uses motor with simial principle. Head uses standard servo motors, which can be easily replaced. It's possible to buy these motors online or even in your local department store. At the moment TenniRobo mobile app is fully supported by all Android smartphones with Android 4.4.4 or newer (5/6/7/8). It's a handy option, which allow you to change ball's behavior interactively, while TenniRobo is making shots. 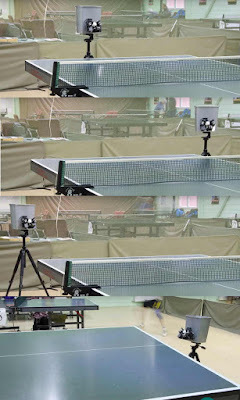 Any change in mobile app will be immediatelly applied by robot: you will see where ball is falling, how fast it flies, is interval between shots good for you. You can use it when you want to adjust existing preset, or create new one. Yes. I'm working with new features continuously. A lot of new features can be added with upgrading of mobile app, and it doesn't require firmware upgrade. But TenniRobo' smart controller already has ability to upgrade its firmware - this option already has been fully tested. I know, there are a lot of electronic devices have problems after upgrading firmware (for example unpredictable power-off can damage firmware in these devices) - this is not our case. I put a lot of efforts to this part, so Tennirobo's bootloader (code which does firmware upgrade) can't be erased or damaged in any case. Your robot's firmware upgrade will be painless and risk-free. 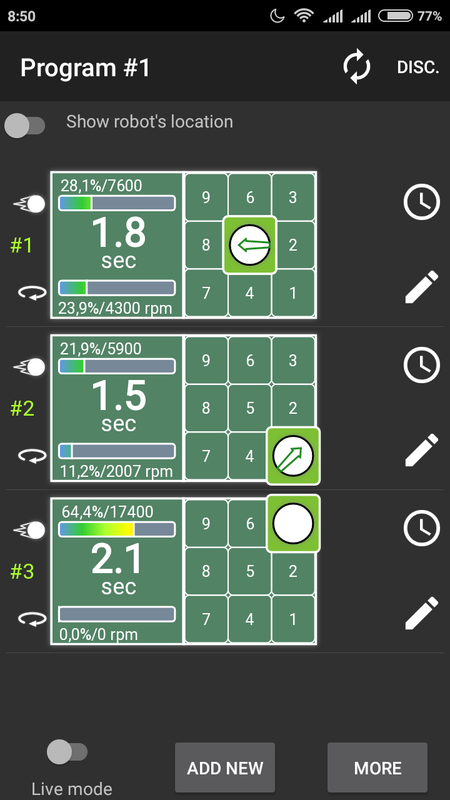 In the future, when new firmware will be released, you will be able to upgrade your TenniRobo just from your smartphone. Yes, it's safe. Although motors are really strong and fast, they are controlled by very smart electronic controller, which is checking motor's power and speed all the time while the motor is working. As result, when motor's speed is decreasing unpredictable, the controller just stop the motor and trying to do a soft start again with very low force. Brushless motors with smart controller - it's a big advantage of the TenniRobo. Many other robots use standard brushed motors, which don't have this option. Yes, it is possible to ship it worldwide. Even more, it is possible to mark it as gift. Now TenniRobo looks like a prototype, so you probably won't pay customs fees for it. There are a lot of payment methods are available. It can be even Western Union, if you want. But I have huge experience as Ebay seller, and I know how important to be safe when you buy something online. So I accept PAYPAL (trusted US account) as the safest for you payment method.